Have you been dreaming of a 100% natural way to revitalize, renew and protect your skin, hair and nails from the inside and out? How about a “Miracle Berry” that can help control with your weight loss routine? Sibu™ Beauty has a wonderful product line that harnesses the power of sea buckthorn berries including facial creams, therapeutic grade seed oil, liquid dietary supplements, gel capsules and facial soap. 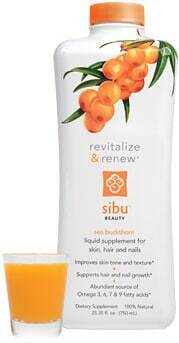 I have been using the Sibu™ Beauty Sea Buckthorn Liquid Supplement that is designed to improve skin tone and texture for skin, hair and nails. Every morning I enjoy drinking one ounce after eating my breakfast and I really like the crisp, pleasantly tart fruit taste. I appreciate that sea buckthorn fruit puree is listed as the first fruit on the ingredients list followed by the impressive addition of acerola, banana, white grape and apple juices. It has only 25 calories and 4 games of sugar per serving along with vitamins and of course the product’s star, essential fatty acids, courtesy of the exotic sea buckthorn. I have been going through a detox nutritional program and one of the side effects has been breakouts of the skin as the toxins are exiting the body. After 15 days of using this supplement in conjunction with other Sibu™ Beauty products I have noticed that my skin is glowing and has a much clearer tone. I also take 2 softgels daily of the Cellular Support with Omega 7. This dietary supplement was created to nourish the body from within with a proprietary blend of both sea buckthorn fruit and seed oil. Since using both of these products, I recently went to visit my stylist who commented, “Wow, your hair is really growing fast and is in better condition…..what are you doing differently?” I have long, highlighted blond hair and prior to starting this supplement routine, I had 1.5” of damaged hair cut off and on my last visit I only needed a .25” trim. I don’t know if this can be attributed to Sibu™ Beauty but for me it is a very promising sign that the products are working well for my hair and skin. I absolutely love the Daytime Facial Cream that was created to repair and protect the skin. I love how this lightweight cream is so nourishing and absorbs instantly into the skin. My facial and neck skin feels truly soft and supple and my SPF foundation glides on effortlessly over this day cream. There is no oily residue…..simply glowing skin that does not feel dry or parched. I am vigilant about protecting my facial skin since my recent bout with skin cancer and I love that this cream was formulated to protect against environmental stress. The certified organic Sea Buckthorn Seed Oil is a “must have” product in my skin care kit. My daughter has severe eczema and just a dab to the affected area has really made a difference providing relief of her itching, dry, scaly skin. I also apply it to my three year old son’s scar (he is recovering from severe 3rd and 2nd degree burns to his right arm and wrist) every night and have noticed that it is softer and his wrist is more flexible. He likes it so much that if I forget to apply it he is sure to remind me to put on his “burn oil.” For myself, I use it on the small lines (I refuse to call it a wrinkle) on my face and like how it absorbs with no residue. Overall, I am very pleased with all of the products that I am using from Sibu™ Beauty and I appreciate that this company has fair trade agreements, using only organic or natural ingredients with no parabens and is committed to sustainability. This is definitely a product line that I will continue to use and I can’t wait to try new products such as the Hydrating Serum, Anti-Wrinkle Eye Cream and the Nighttime Cream. You are invited to learn more about the Sibu™ Beauty product line and particularly the potential benefits of using the Sea Buckthorn. There is even a fascinating video excerpt from the Dr. Oz show, calling it the “New Miracle Berry” that you can watch over at the Sibu™ Beauty website. Check it out! The products that I have been using are available for purchase in the Sibu™ Beauty online store, Whole Foods, Chamberlains and more retail stores. Connect with Sibu Beauty on Facebook and Twitter.